Energy. Everything is energy, the table, the chair your sitting in, the water you drink. Most things in their natural state have a positive effect on their surroundings. Other things like cell phones, microwaves, Wi-Fi, televisions create negative ions or stale energy. This has a negative effect on your natural energy balance that can cause fatigue, irritability even depression. Orgone is based on William Riechs research and his work with orgone. We all know copper and other metals are great conduits for energy. All our electricity is wired thru metal. By using metals and the energetic vibration of crystals combined in resin you can change the negative ion output back into positive ions. The resin squeezes the crystals as it dries activating the piezo-electric properties naturally. 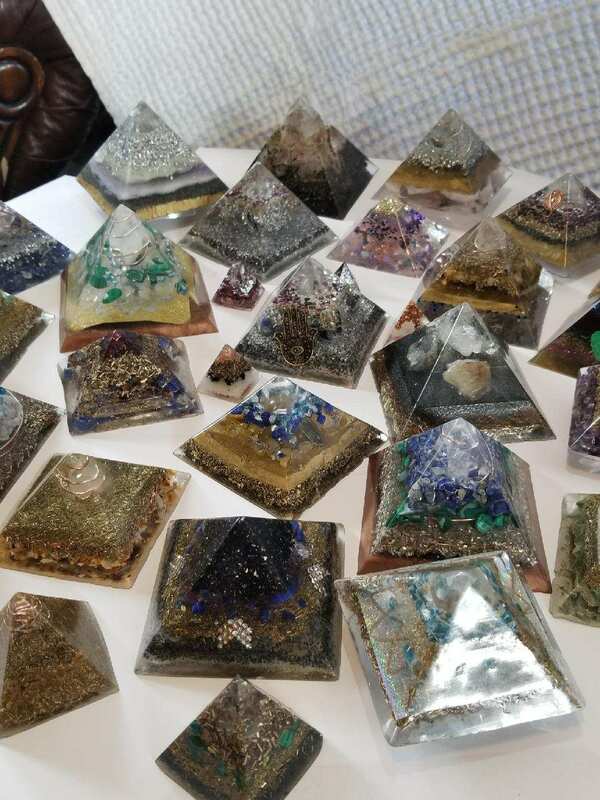 The metals in the pyramid shape draw negative energy into it then the combination of metal and crystal releases positive ions back into the environment. Proven to effectively balance the energy in your home or office where any Wi-Fi or other electronics create static electricity. Can help with fatigue, insomnia, use in meditation, promotes physical, emotional, spiritual, and mental balance. Creating a positive environment for your well-being in all areas of life!